When the bagged salad industry was in its fledgling stage, E-coli food poisoning was traced back to a bagged spinach producer. This caused industry-wide panic. Another incident was traced to a famous lettuce producer who did not take proper precautions with its H-Vac (air conditioning) system. Due to improper maintenance, E-coli subsequently found its way to romaine and iceberg lettuce and was responsible for many reports of food poisoning and even death. Listeria is another type of bacteria that can be found in uncooked poultry or other raw food products. It can be quite harmful if someone is infected with this food-borne bacterium. For these and other reasons, there is no place in the world of food processing for substandard or unsanitary food production. In fact, STAR-K certifies Intralytix, a biotechnology company focused on food safety, sanitation and other products developed to control bacterial pathogens in a food processing setting. The Torah is passionate concerning health and safety in general, and food safety in particular. Based on the pasuk, “רק השמר לך ושמר נפשך מאד”, “Only be careful and watch yourselves closely”,1 one is to exercise spiritual as well as physical watchfulness. 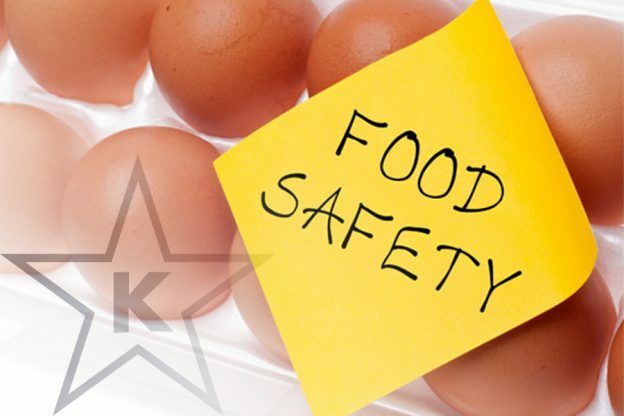 There is discussion amongst the commentaries regarding risk-taking, personal safety and being careful to maximize food safety and a high standard of hygiene in food establishments. Although the argument can be made שמר פתאים השם,2 “Hashem watches over the unaware, the truth is that Chazal tell us אין סומכין על הנס, we don’t count on miracles. Halacha is quite insistent about not taking risks and chances with one’s health and well-being. In fact, there is another aspect to health, well-being and taking health risks. Chazal tell us מאסורא חמירא סכנתא,3 one should be careful to avoid dangerous situations that can pose health threats to life and limb. Of course, there are the “no brainers” – walking alone in a dangerous neighborhood or climbing a high tree while untethered. Moreover, there is a whole area that transcends the obvious areas of risk known as שמירת הגוף והנפש, health precautions. Volumes have been written regarding the subject of well-being and health risks. Some of the most well-known areas of discussion include mixing fish and meat, leaving peeled onions, garlic and eggs overnight, uncovered beverages and leaving food and beverages under a bed or stroller. There are many “hanhagos” that are commonly practiced and many that are not. The following דינים ומנהגים reflect STAR-K policy and the p’sakim of HaRav Moshe Heinemann, shlit”a, Rabbinic Administrator of STAR-K. Although according to most authorities it is permissible to cook meat in a fish pot or fry fish in a meat pan,6 it is STAR-K policy to follow the opinion of “יש מחמירים” and require caterers to have separate utensils for meat and fish. In the event that fish was cooked in a meat pot or vice versa, מעיקר הדין it is permitted. STAR-K policy is to be מחמיר. Halachically, there is no difference between cooking, roasting or broiling. Do the same restrictions apply to chopped or peeled raw onions, garlic or cracked eggs that have been left overnight? Some authorities say they do, and some are lenient in this regard based on a ruling by Rav Moshe Feinstein, zt”l. He stated that since the custom of not leaving peeled onions, garlic and eggs overnight is not mentioned in the Shulchan Aruch, we are permitted to be more lenient with peeled raw products from a factory or industrial setting. It is STAR-K policy to follow the ruling of Rav Moshe Feinstein, zt”l. As we know, the Torah mandates והתקדשתם והייתם קדושים”,12“ we should sanctify ourselves so that we should be holy; just as the Ribono Shel Olam is קדוש, so too should we emulate Him. Just as we follow the laws of kashrus unwaveringly without question or compromise so, too, the laws of שמירת הגוף והנפש should be treated with the same sanctity and zeal.